In a media saturated, success driven culture, the most coveted place to be is the winner’s circle. However you get there – sports, business, politics … on a self-interested or altruistic path – what matters is that you get there, to that place in time where you get to hear the applause, spray the champagne, return the high fives, and fervently shout “YES!” With this interactive, multi-media performance event, collaborative artist duo JEFF&GORDON will give visitors to the gallery the opportunity to bask in their own personal moment of glory, without any of the work to get there. With the aid of live video compositing, the artists will transport each participant to the location that corresponds to their version of success. 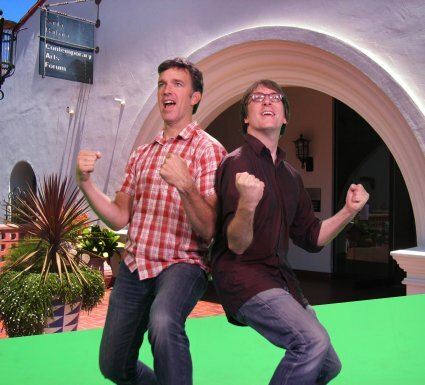 The addition of the appropriate props, audience participation, and the like will complete the picture, enabling each participant to act out the fulfillment of their ambition, and re-live it forever on video. Part of the "Forum Lounge" series, Thursday, December 6th, 7-9 PM. Visitors may arrive at any time but are encouraged to come at 7PM. Admission: FREE. Link: HERE. What's in a name? That which we call a NASCAR driver by a slightly different name would be an artist group. Such is the case with JEFF&GORDON, the artist duo comprised of Jeff Foye and Gordon Winiemko; and Jeff Gordon, the charismatic NASCAR driver (#24). The ampersand—the symbol for the Latin word for “and”—is all that separates the artist duo from the driver. Such a small detail can be easily overlooked, or so it would seem by the number of Jeff Gordon NASCAR fans who mistakenly “like” the artists’ Facebook page. 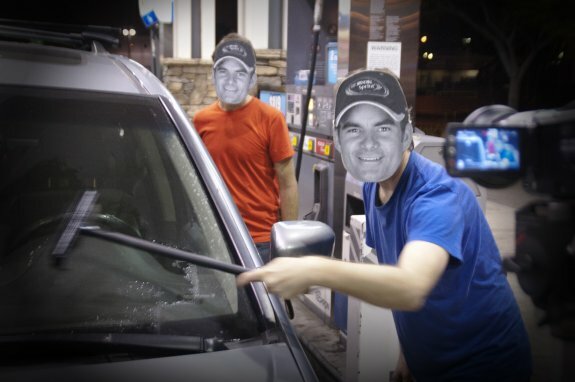 Used with Deceit examines public identity and fan culture; JEFF&GORDON have taken these incidents of mistaken online identity as a point of departure, appropriating Jeff Gordon Youtube videos posted by fans and altering them in various ways to conflate the artists with the titular subject. Into NASCAR video game footage featuring Jeff Gordon's car, the artists insert themselves driving around the block multiple times in defiance of a "no vehicular cruising" law; into a clip of the race car driver and his mother cooking with a family recipe on the Rachael Ray show, they insert themselves having a curious encounter with a fried egg; into a fan video of Jeff Gordon winning a race, they insert themselves performing everyday tasks while wearing identical Jeff Gordon masks. JEFF&GORDON will ultimately deposit these (and more) clips back onto Youtube; this exhibition will be their public premiere. Facebook Invite with directions. On the court of a tony club or ivy covered institution, another Squash player makes an aggressive serve, or politely calls for a "let," ending the rally because his opponent accidently interfered with his shot. In a Riverside neighborhood or Inland Empire community, another family gets a foreclosure notice, just one of an estimated half a million California families that will lose their homes in the national foreclosure crisis. Do we really declare all of these people losers at the game of life, or might we be able to grant them a "let"? What are the limits of personal responsibility, and achievement? Applying their usual performative appropriation of social customs and idioms, the collaborative duo of JEFF&GORDON take on the tension between cooperation and competition that runs through the public discourse in a nation of "temporarily embarrassed millionaires." Sweeney link.